When you’re all set, it’s time for CleanMyMac to show you some Smart Scan magic. One by one, Smart Scan launches these modules to sort out unneeded or harmful items and prepare a set of necessary optimizations. 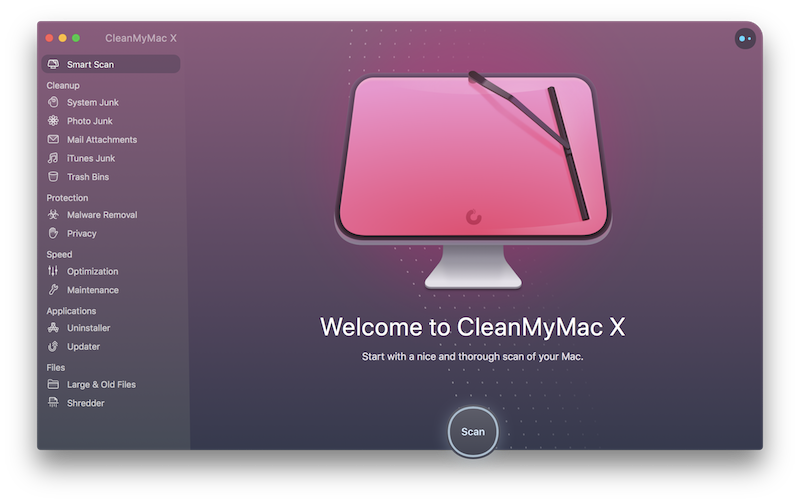 Open CleanMyMac and click Scan on its welcome screen. Please note that the process may take some time, especially if your Mac is a mature workhorse. When the analysis is over, you see a total amount of data that can be removed safely, a number of found threats, and a number of optimization tasks. Review types of selected items and tasks: Click on a scanner icon to get general info about types of selected items and tasks to be run. Deselect a checkbox next to an item or task to exclude it from the Smart Scan list. Check detailed scan results: Click Review Details below a scanner icon to review items found by Cleanup and Protection scanners. Switch between categories and deselect those items you don't want to delete. When you're ready, click Run to complete the cleanup and start maintenance tasks. Be sure, CleanMyMac doesn’t delete any user files or useful app data unless you want it. Years of experience allowed us to create a reliable Safety Database that prevents cleaning mishaps and carefully treats all user data. Go to CleanMyMac X → Preferences →the Scanning tab. Deselect the checkbox next to a submodule or module that must be excluded from the scan process. Note that if you exclude some System Junk or iTunes Junk submodules from the scan list, they are also ignored during a separate scan in System Junk or iTunes Junk, relatively. For example, if you deselect the User Cache Files submodule of System Junk, this submodule is ignored during both Smart Scan and a separate scan in System Junk. If you deselect a checkbox of System Junk or iTunes Junk (including all their submodules), the corresponding module is ignored by Smart Scan, but fully scanned when you start it separately. Your Mac can breathe freely after Smart Scan procedures, but you should definitely try other modules to achieve better optimization results.